Banana Bread Pudding, An Easy Crowd Pleaser | Ordering Disorder | Work It, Mom! So do you ever have questionable bananas but totally do not feel like baking banana bread? And by questionable I mean bananas that now have slightly speckled skin and are therefore summarily rejected by the children who insist that they are rotten, even though they are not. And do you also ever have stale bread? Then this is the recipe for you. 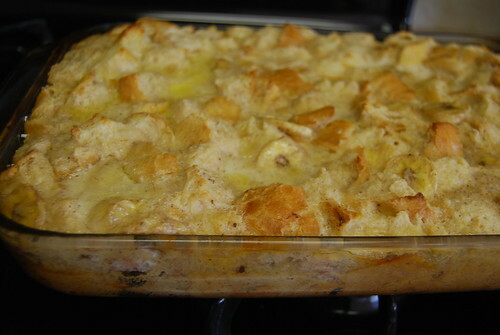 I have made this for people who have insisted that they hate bread pudding. Turns out they just hate dry bread pudding. Good bread pudding is just like French Toast on steroids. 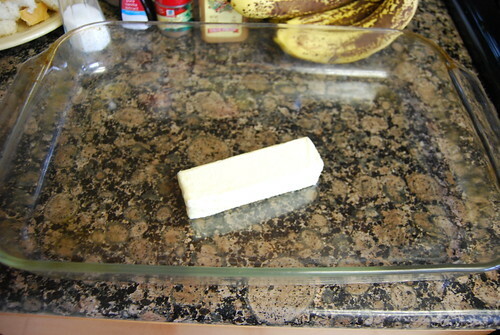 Place your stick of butter in an 11″x13″ casserole pan. Stick it into the warming oven to melt the butter. 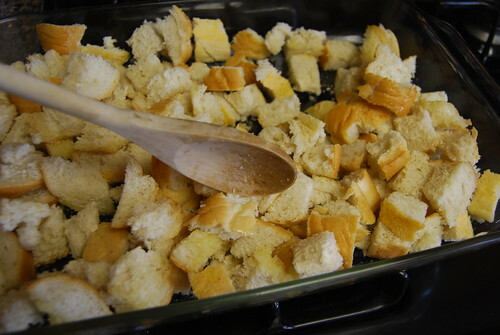 Once the butter is melted, remove baking dish from oven and stir in the cubed bread. In a large bowl mix together all the other ingredients EXCEPT the bananas. 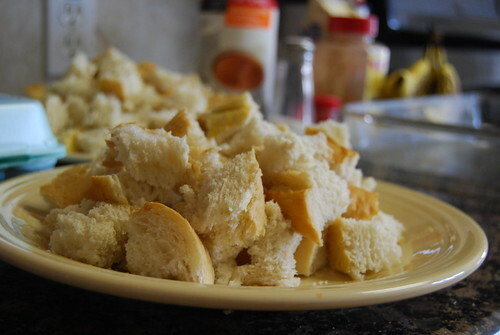 Pour the egg mixture over the bread and mix thoroughly. You want all the bread to be soaked. That is what makes it turn pudding-like. Then gently stir in the banana slices. Place in the preheated oven and back for 40-50 minutes, or until a knife inserted in the center comes out clean. You can eat it hot, right out of the oven, which is usually what happens with half of it,because my children do not have patience. Or you can put it in the refrigerator and let it chill, which is my personal favorite. This entire pan was gobbled up in record time, with my children asking if I could buy rotten bananas again soon. Are you back to eating gluten again? This sounds so yummy. I totally agree about using French bread, other bread works, but IMHO sourdough French bread is the best kind for French toast and therefore must also be the best kind for this as well. Incidentally, last night for dinner I made your pesto again. I had some parsley so I tossed in a little of that too. I couldn’t taste a difference, which means that it was great as usual. Chris says: Sadly no, I will never be ableto eat gluten again. 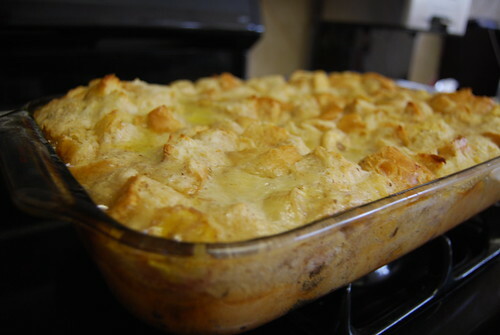 And this bread pudding is one of only a handful of things I truly miss. Oooh, I’ve been hoping for something besides banana-chocolate-chip muffins! Though hubby & kid will probably insist on chocolate chips in this too. Not that there’s anything wrong with that! I think I will insist the bananas get speckled this week so I can make this. Looks SO good. Speaking of gluten. What are the meals you are eating these days? It seems that everywhere I look we have another gluten allergy in our area. I have a dinner to make (and a dessert) next month for a family with a gluten allergy. Any ideas? Any favorite meals you have? Thanks! Chris says: Most of my favorite recipes are posted here! The Chicken Curry With Sweet Potatoes is loved by everyone and is easy to transport in a crockpot. The Pulled Pork Sandwiches are also another easy and delicious choice. You know…I make the same type of thing…as french toast. 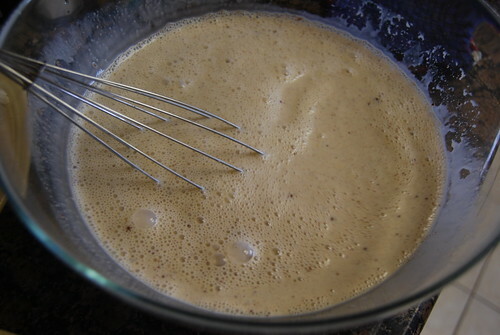 And the beauty of it is, you can refrigerate it over night (to REALLY let the egg mixture soak in). Change out the bananas (or keep them) for other fresh fruit: blueberries is a favorite around here. Or I’ll use cinnamon bread. Sometimes I’ll even cut up cream cheese into small 1/2-1″ cubes and throw that in too. Bake then serve with syrup (as if it wasn’t laden enough with calories) and fresh fruit (to “even” out the meal). Chris says: I have a recipe like that, too! I think the only real difference between the two is that it doesn’t have sugar. The fruit makes it healthy, right? Ooops! Let me start again…. I’ve made something similar in the past- but with chocolate chips. TO DIE FOR! this looks soooo good right about now! I made this recipe over Memorial weekend. It was just for two of us, so I halved everything, baked it in a smaller casserole dish, and it turned out great. I didn’t have any 1/2 & 1/2, so I used skim milk and some over-ripe bananas I had in the freezer. My b/f and I both agree with you that it got better as it cooled off. Will definitely make this again. Thank you so much for this recipe. I bought the bakery half price yeast rolls at the end of the day and they were perfect in this. My 1 yr old loved it and that’s saying a lot right there. I agree that it’s excellent when cool. heya - stupid question of the day — what’s the oven temp on this one? and !!! when you write “T” on your ingredient lists- I am assumming thats a TABLEspoon? And yes, big T is tablespoon. Little t is teaspoon.